The iconic Adirondack chair got its start in 1903 when a gentleman by the name of Thomas Lee acted upon a shortage of outdoor chairs at his summer home in Westport, New York, by Lake Champlain in the Adirondack Park. Testing out various prototypes for members of his family, Lee arrived upon the first incarnation of the slanted-back, broad-armed wooden chair that is still a staple on porches and decks today. The chair Lee designed was comfortable, sturdy, simple in design, with flat surfaces. It was quite different from the highly ornate Victorian furniture of the period and was viewed as a fresh alternative to looks that mixed Gothic ornamentation, Rococo and Eastlake. In a benevolent gesture, Lee shared his design with a down-on-his-luck carpenter friend and hunting buddy, Harry Bunnell. Unbeknownst to Lee, Bunnell took the design and received a patent for what he called the Westport chair in 1905. For the next 25 years, Bunnell profited from his friend's design, and Adirondack chairs began to appear on porches and in gardens from coast to coast and abroad. The chairs were popular in Europe and a staple in mail-order catalogs for more than 20 years. Vintage examples can still be found throughout the world. 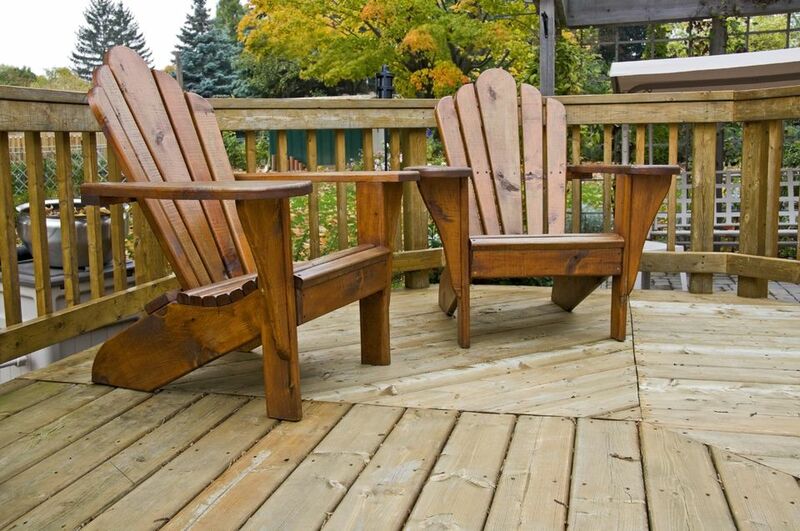 The design for the Adirondack has a history of being "borrowed" or adapted. Some believe its original design was influenced by the William Morris chairs introduced as part of the Arts and Crafts movement in the mid-to-late 1800s, which was introduced in England during the Great Exhibition of 1851. In the United States, the Arts and Crafts style was known as Craftsman, and became popular in the early 20th century. In the mid-1930s, Irving Wolpin received a patent for his own interpretation of the chair, which featured a more rounded back. Apparently, it was Wolpin who gave the chair its familiar name, Adirondack. Constructed from an assembly of spaced wooden laths, the Adirondack chair is identifiable by two special features: its wide armrests and a back that slants at an angle. The chair was either left in its natural state or painted -- often a redwood brown, chestnut, green, blue-grey or white. Different versions include high-end teak, durable shorea, and more modern weather-resistant polyresin models. Miles Comins chair, a version of the Wolpin chair, designed by Comins in his gas station basement during the early 1940s. Newer variations include slots to hold beverages and modern takes that include hip colors like chartreuse, aqua, white, black and even bright pink. Outdoor Spaces: What is a Veranda? What Is a Loggia Used For? What is a Gazebo Used for in a Landscape?